RancherMan loves pizza. I mean LOVES pizza. As in that man could eat pizza every day for days on end and be a happy boy indeed! I’ve made homemade pizza crust and of course those pizzas are delicious, but ranch work often brings us dragging in after dark and making the dough, letting it rise, baking it up routine often doesn’t fit our lifestyle. 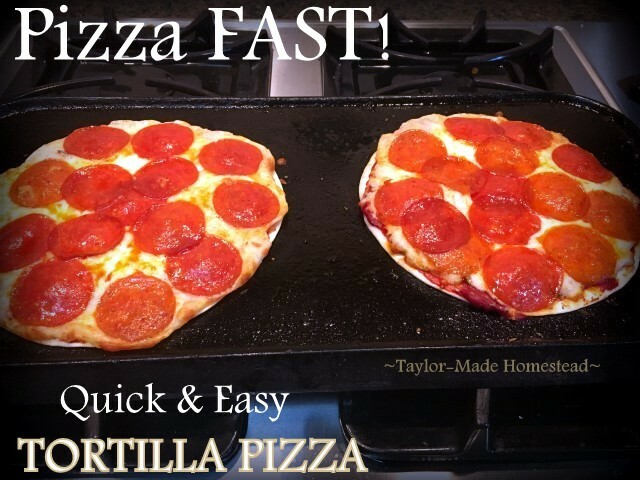 For a quicker version I’ve made French Bread Pizzas and although RancherMan loves them, this is an even easier (and FASTER) way to get some pizza in his belly. Tortilla pizza. Now hang onto your hats folks, this is one quick meal and certain to please everyone in the family – from RancherMan all the way down to the grandbabies! I preheat the oven to 425 degrees using my speed-bake option (a fan-assisted convection feature that cooks food faster than traditional bake) I have a heavy cast-iron griddle that I often use to make 3 or 4 at a time, but I also have two single-serving *comal pans (a small round short-sided pan) that I use when it’s just RancherMan & me. Whatever cast-iron vessel I use I place it in the oven while it’s preheating to get the surface good and hot. Now I’m turning my attention to those pizzas. I start by adding a tomato layer on top of the tortilla. Recently I dehydrated several 5-6″ tortilla-sized dehydrated tomato leather from some leftover pasta sauce. I like to have these in the pantry because I kid you not – you roll them on top of your pizza crust (or tortilla in this case) and just start piling on toppings – no other step is necessary. The toppings rehydrate the leather as the pizza is cooking. I LOVE these things! But obviously you can use tomato paste here if you don’t have leather. Then a light sprinkling of cheese to anchor my fillings to the crust, and I start adding my toppings. RancherMan prefers pepperoni but pepperoni makes me gag. LOL. I prefer to pile mine high with veggies – diced onion, bell pepper, jalapenos, from the garden. I also like to add black olives, and mushrooms. YUM. I’m sure to dice the veggies small, since they’ll be in the oven such a short time I need them to cook quickly. Then I sprinkle a little more cheese on top and bring out my now-hot comal pans. I slide the tortilla pizzas from the plate to the hot comal and put them both back in the oven. Now the speed bake does a pretty quick job and I’m just looking for the cheese to get all melty. It typically takes only about 5 minutes. After that time I pull them out of the oven & RancherMan’s already hovering around me exclaiming that the kitchen smells delicious. I slide ’em on a plate and he digs in with relish! The cast iron helps the crust to get crispy and this quick & easy meal certainly helps me give him the pizza he craves while saving my sanity after a busy day at the ranch. C’mon by & sit a spell! Come hang out at our ~TMH~ Facebook Page. It’s like sitting in a front porch rocker with a glass of cold iced tea – lots of good folks sharing! You can also follow along on Pinterest, Twitter or GooglePlus. This entry was posted in Blog Posts and tagged Cooking, Frugality, Make-It-Yourself on September 11, 2016 by Texas Homesteader. I love this idea and using tomato leather blows my mind! Plus, I try to eat low-carb as much as possible, so I could easily use low-carb tortillas. Thanks for the great ideas!! Easy and quick recipes are my favourite and I know everyone in my family would love this tortilla pizza! The perfect quick dinner! It looks great! Your pizza sounds tasty and quick. I have made tortilla pizza. When my son was in Afghanistan he wanted pizza and I found a packed tortilla pizza and I got it and sent it to him. It was basically a tortilla which they said to toast in a skillet, then add tomato sauce, toppings and cheese. Cook in the skillet covered until cheese is melted. I have done this at home with ingredients I have purchased separately at the grocery store or home grown. This is a quick and easy way to make dinner.